There really is no telling what the truly magnificent pianist Harold López-Nussa will come up. He has participated in some of the most remarkable projects – Ninety Miles – is just one of them. 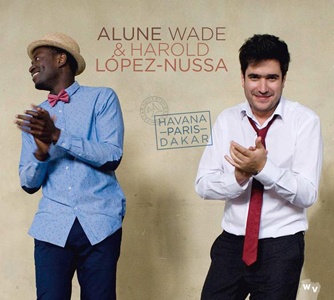 But Havana-Paris-Dakar is a recording co-led with Alune Wade, a performer who is almost as enigmatic as Youssou N’Dour, but who also plays the bass with melodic beauty. 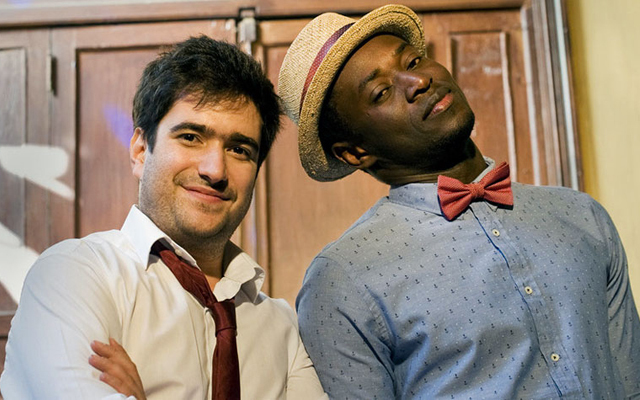 The idea is to unite the music of Cuba with its African roots. There is one difference though: Afro-Cuban music derived largely from the traditional music of Nigeria, melded together with that of Europe – Spain, to be precise. That does not stop López-Nussa, who makes a fine repast of the memorable union, just as he did in the case of Ninety Miles. This one is a little bit trickier that the former because the music of Senegal is given a risky twist: The sabra drummers are nowhere in sight. The non-existent Senegalese drumming does not prevent this disc from being impossible to identify with Senegal in particular, Africa in general and Cuba as well. Alune Wade picks apart his native music on his bass and he sings with an ethereal falsetto, calling to mind his more celebrated counterpart, Youssou N’Dour. More remarkably (but not surprisingly at all) the pianist’s brother Ruy Adrian López-Nussa more than makes up for the missing Senegalese drums with Afro-Cuban polyrhythms of his own. The younger López-Nussa is a truly gifted drummer and percussionist as well and is one of several members of the fabled López-Nussa dynasty from Havana. The brothers have a long history together, respond telepathically to each other and make the most exciting music together. The beauty of the Afro-Cuban music on the disc is made more complete by the haunting trumpet of Reinaldo Melián, whose auspicious introduction to the music of the world came from no less a luminary as Gonzalo Rubalcaba. The track that launches the music of this recording – Animata – is somewhat misleading in that it can give the impression that this is pop music from Senegal. But that impression soon changes as Petit Pays comes on. Harold López-Nussa is able to make sense of all of these cultural collusion and collisions with a great deal of flair. His worldly-wise musical awareness comes not only from his father and his record collection from the years that pianist spent imbibing it all from an ancient capital of music – from classical to jazz and from African to Indian strains – and that is Paris, France. López-Nussa speaks often of the sharp arc of his learning curve because of his days in France. Of course, he does himself some injustice because his genius is inborn, which is why is one of Cuba’s premier pianists and musicians. But there is his precocious ability to absorb cultural and musical influences like a proverbial sponge. Harold López-Nussa’s solo piece is a model of gracefulness and soaring beauty. But he is also a stellar contributor to the African compositions and is particularly brilliant on Salif Keita’s Seydou. There is also a surprising turn from the celebrated guitarist Wolfgang Muthspiel on Petit Pays. The svelte lines from the guitarist seem made for the piece, made all the more remarkable by Sara Tavares’ vocals – sadly her only appearance on the album. Then of course, there are the unforgettable solos from Reinaldo Melián. Add to all of this the excellent engineering and you have a recording captured with precision and great warmth. Another compelling reason to own this disc. Track List: Animata; Petit Pays; Sagô; Guajira; Yarahya; Aye Africa; Salimata; Independence Cha Cha; Nussa Solo; Dom; Seydou; Senegal. Personnel: Alune Wade: lead vocals, bass guitar; Harold López-Nussa: piano, with Adel Gonzalez: percussion; Ruy Adrian López-Nussa: drums, bongos; Reinaldo Melian: trumpet, and Adhil Mirghani: cajón (5); Wolfgang Muthspiel: guitar (2); Orchestra Aragon: backing vocals (1, 8, 12); Aziz Sahmaoui: additional percussion (4); Hervé Samb: guitar (7, 11, 12); Sara Tavares: vocals (2); Amen Viena: guitar (1, 8).